Gospel group that briefly dabbled in rock before its leader, J.C. Ginyard eventually formed another group that was rock through and through. 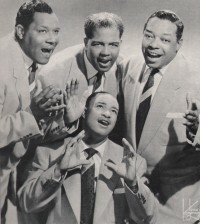 Ginyard had been in The Jubilaires, a popular jubilee styled gospel group of the 1940’s, but upon the addition of a new member tensions began to surface and Ginyard departed, forming The Dixieaires with members of other smaller gospel outfits. Though all of their work retained some connection to spiritual themes, they were either enticed into recording secular material by labels seeking broader sales, or they legitimately saw little difference between the intent of a handful of songs they were offered. One of these, “Go Long”, became a legitmate Race Chart hit, something that was quite rare for pure gospel which shows that a wider audience did indeed embrace the song which had a rock backing and more ambiguous lyrics. They followed it up with a few others that skirted the boundaries as well and in the process helped to bring the emotional group vocal approach to rock in a small way, but soon they returned exclusively to cutting gospel songs where they remained quite popular for a number of years. Ginyard however was convinced by this brief flirtation with the devil’s music that there was either money to be made there, or that the rock audience wasn’t headed to hell, or at least there’d be a long way to go before any of them got there, so in the early 1950’s he formed The Du-Droppers who performed strictly rock material and scored two Top Three hits in that realm.